Hey, winning. That's nice. I forgot what this was like. Let's bask in this a little bit. Of course, there's no rest for the weary; with a number of matches needing to be rescheduled, Arsenal will have to deal with fixture congestion pretty soon. For now, we have the bizarre circumstances of two consecutive Monday night games before an FA Cup Semi-Final, then a Wednesday night game. You can only play games one at a time, of course, so that means we should only be focused on Palace at Selhurst Park on Monday rather than what might be looming over the horizon. Palace have been doing well lately and had won four straight before Wednesday's loss to Southampton. They're still fighting relegation, so this fixture is easier said than done. Three points in South London, though, will go a long way towards getting that swagger back. Well, Monday night game after a Wednesday night game means Friday isn't exactly the best time to speculate about injury status. Though, Santi Cazorla will miss out, I can tell you that for sure. Will Emiliano Martínez remain in goal? Is David Ospina still out? Will Petr Čech be back soon? Matt Macey was recalled from his loan at Luton Town after Ryan Huddart was on the bench Wednesday. Elsewhere, how is Laurent Koscielny's Achilles doing? How much longer is Hector Bellerín going to have to run on an ankle that clearly requires surgery? Are there other questions I can ask? How cold is it going to be? Will it be foggy? So... I'm going to guess no changes from the XI that beat West Ham on Wednesday, unless one of the 'keepers returns. Predicted XI: Martínez, Bellerín, Mustafi, Gabriel, Monreal, Elneny, Xhaka, Alexis, Walcott, Özil, Welbeck. Well, the injuries are really starting to build in Palace's squad, which could be a death knell for them in a battle against relegation. There are at least seven players who have been ruled out for Monday, with at least four others looking doubtful. Let's see... Connor Wickham's season is over with an ACL tear. Scott Dann is out until the beginning of next month, at least, with a knee injury. Yohan Cabaye is expected to miss this one with a calf injury. Steve Mandanda is on a long road back from a knee injury. James Tomkins, out with a calf problem, could be available next weekend. Pape Souaré, on the way back from a thigh problem, is lacking match fitness. Same goes for Loïc Rémy as he comes back from a calf problem. Jonathan Benteke has a meniscus injury; they said four months in late September, so I'm not really sure there, sounds like Arsenal's kind of injury timeline. James McArthur, who has back spasms, is probably most likely from the list to feature. Both Patrick van Aanholt and Frazier Campbell are close to returns from ankle and hamstring injuries, respectively. Predicted XI: Hennessey, Ward, Kelly, Sakho, Schlupp, Flamini, Milivojević, Puncheon, Townsend, Zaha, C. Benteke. All jokes aside, most of the results from this midweek round of fixtures helped Arsenal in the top four race, some welcome good news for a change. Liverpool drew, Manchester United drew, Manchester City lost. Arsenal still have at least one game in hand on all of the teams around them (and two on Liverpool.) They've pipped United for fifth, for now. They're four points back of City for fourth and six points back of Liverpool for third. Again, with two games in hand on the Reds and only two goals behind the Merseyside squad on goal difference, the gap there is attainable. Arsenal also have a better goal difference than both Manchester squads at the moment. Put a few wins together and things aren't so bleak anymore, eh? Crystal Palace had won four straight, but found themselves on the wrong end of a 3-1 scoreline at St. Mary's on Wednesday night; Southampton scored twice late to take all three points after the Eagles had scored first. Palace also have a game in hand on most of the clubs around them, but their 31 points leave them precariously in 16th place. They're only three points clear of relegation, however, with eight games in play. The Gunners won the reverse fixture on New Year's Day by a 2-0 scoreline, though you're really only likely to remember one moment from the match, Olivier Giroud's opening goal. Giroud's scorpion kick gave Arsenal a 1-0 lead on 17 minutes. Alex Iwobi sealed the victory on 56 minutes. Arsenal won at Selhurst Park last year, 2-1 in what had been the second match of the season. After the Gunners lost 2-0 on opening day to West Ham, Olivier Giroud notched Arsenal's first goal of the season on 16 minutes. Arsenal's lead lasted only a dozen minutes as Joel Ward scored from long distance to equalize for Palace. Arsenal took the lead on 55 minutes when an Alexis header was turned into the net by Damien Delaney. Their 1-1 draw at the Emirates later in the season was Arsenal's first non-win against Palace since the Eagles' 2013 promotion. 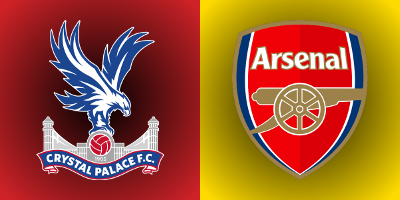 Crystal Palace have beaten Arsenal only three times in 38 all-time meetings; two of their three wins came at Highbury, one in 1970 in the League Cup and the other in 1994. Overall, Arsenal are unbeaten in 15 against the Eagles, winning 10 of them. The referee is Northumberland-based Michael Oliver. Arsenal have seen Oliver four times already this season, with widely varying results. First, he took charge of Arsenal's season opening 4-3 loss to Liverpool, but then was in the middle of the 3-0 win over Chelsea. In January, Oliver was the referee when Arsenal spotted Bournemouth a 3-0 lead at the Vitality before storming back to take a 3-3 draw. Then, in February, Oliver was in the middle of Arsenal's FA Cup trip to Sutton United, which the Gunners won 2-0 over their non-league opponent. In total, a fully surreal two wins, one loss, and one draw. Crystal Palace have had Oliver twice so far this season, both road losses for the Eagles. The first was 1-0 at White Hart Lane back in August, in the second week of the season. The other was at Leicester City, 3-1, in October. You wouldn't know it from all the memorable wins he has worked, but Arsenal have a terrible record overall with Oliver. In 23 matches all-time with Michael Oliver as the referee, Arsenal have a record of nine wins, eight draws, and six losses. They have just three wins from 16 league games. But, perhaps most critically for this match, Arsenal have never won a road game in the Premier League with Oliver as the referee, in seven tries. Palace's all-time record in the league with Oliver isn't much better overall: three wins, a draw, and eight losses. John Painting is a contributing writer to the Modern Gooner and a tornado. You can follow him on Twitter @zorrocat for wind. Much wind.